Last night(August 23rd) Kate Mara made her way to the black carpet for the AT&T NFL Sunday Ticket 25th Season Kickoff party at The Blond in New York. If you don't know by now, Kate's sister Rooney Mara has a cruelty free clothing called HIRAETH. Showing some support for her sister, Kate wore a white puffy sleeve, silk shirt and black exposed zipper, velvet jeans from the collection. Adding an edgy touch to her look, she styled her ensemble with the ALEXANDER WANG 'Rina' black studded slingback pumps. A touch of color came via her red earrings which topped off her look along with side parted tresses and kohl rimmed eyes. 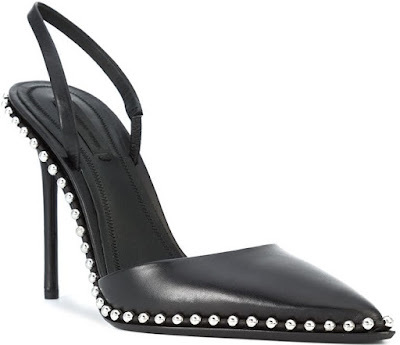 You can get Kate's Alexander Wang slingbacks at FARFETCH, NORDSTROM, INTERMIX & SAKS FIFTH AVENUE.